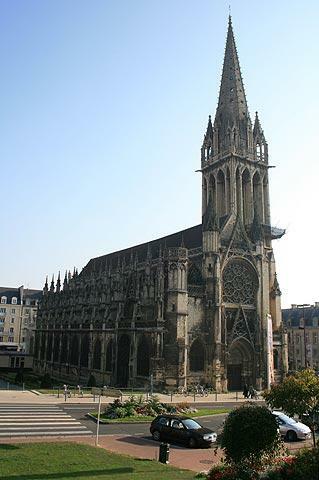 Caen is on the coast in the Calvados department of Lower Normandy. 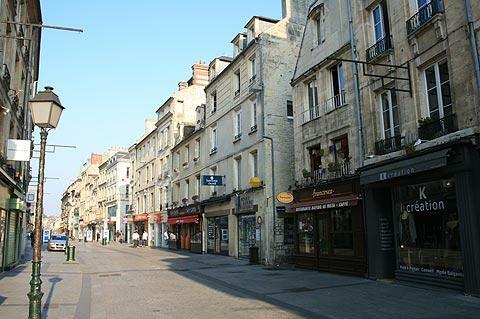 The town was destroyed almost completely in 1944 during WWII and it is a remarkable achievement that Caen has kept so many of its historical monuments given the terrible battle that besieged the town following the Normandy beach landings. After the war the town passed through 15 years of reconstruction, and continued to improve afterwards. In recent years the town has made further significant efforts and Caen now has an attractive, carefully restored, historic centre. Start your visit at the Chateau Ducal. This castle was built by William the Conqueror to house and protect his residential palace. 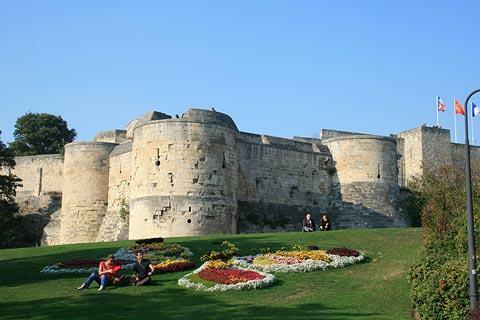 The castle was destroyed in the war but the massive and impressive ramparts remain. These provide great views of the city and are a popular place to relax as well as to visit the Towers which remain. From the ramparts you also have excellent views of the fourteenth century church of St Pierre, parts of which survived the war and some of which has been reconstructed. 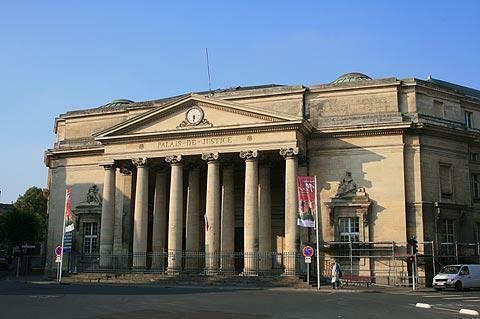 The Musée des Beaux Arts and the Musée de Normandie are situated inside the ramparts.The Musee des Beaux Arts has an excellent display of Italian, French, and Flemish paintings and the Musee de Normandie houses displays showing the history and development of Normandy. Down below the ramparts the main town lies in between the superb Abbaye aux Hommes on one side and the impressive Abbaye aux Dames on the other. The Abbaye Aux Hommes is a really beautiful building and incorporates the Abbey of St Etienne where much of the town sought shelter during the 1944 bombings. Miraculously the church suffered little damage. 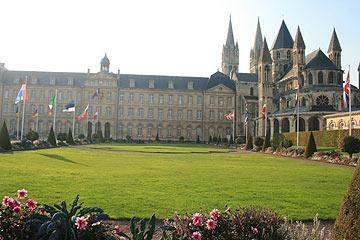 Some of the abbey buildings are now used as Caen Town Hall. 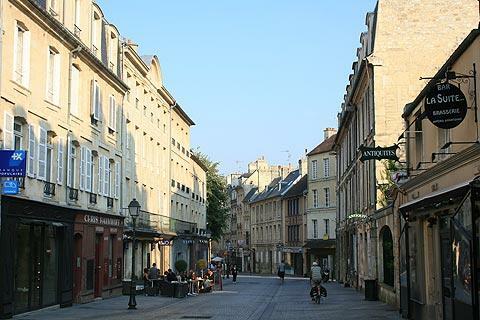 Between the Abbaye aux Hommes and the ramparts is the Rue St Pierre, a lively pedestrian street of attractive buildings and good shops that crosses the heart of Caen. Rue Ecuyere and Rue St Saveur and other streets nearby are also worth a stroll. Also in the centre you can explore the 'old' Vaugueux Quarter, affectionately known as little Monmartre. 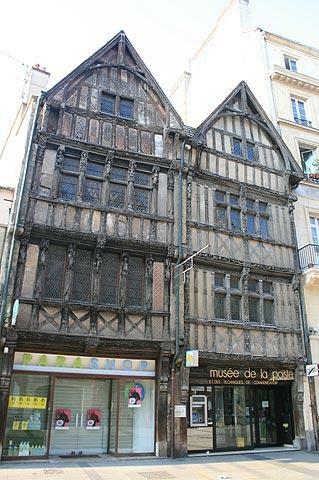 Two other particular highlights are the Maison des Quatrans, a very decorative half-timbered manor house of the 14th century and the Musée de la Poste, another half-timbered building this time from the 15th century. 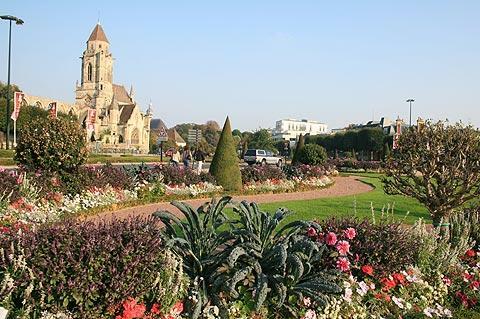 We were also surprised by how many parks and gardens there were in and near the centre of Caen, including the nicely maintained Jardin des Plants next to Place Blot. In the summer Caen's pleasure port, which is close to the Abbaye aux Dames, is a lively place with lots of cafes and restaurants. 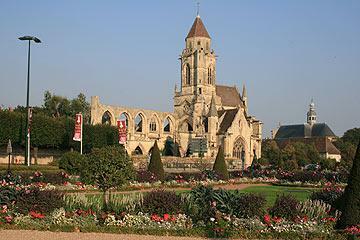 Market day in Caen is Friday and takes place along the ‘Fosses St Julien’ near the Ducal Castle. There is also a Sunday market in the Place Courtonne. On the edge of the town centre, the Caen Memorial is quite a recent addition to the town and is a very impressive museum that explains the history of war in the region during the 20th century. Exhibits and displays help explain both world wars including the Normandy landings and the battle for Normandy as well as the Nazi genocide and the Cold War. After exploring the memorial you can take a stroll in the Bird Hill Floral Park, a very large area of landscaped gardens and parkland with a very wide range of plants and flowers. The Chateau de Bénouville (designed by renowned architect Claude Ledoux) is an important neo-classical style castle built close to Caen in the 18th century. Among the other highlights in the countryside nearby is the picturesque village of Beuvron, about 20 kilometres to the east of Caen. 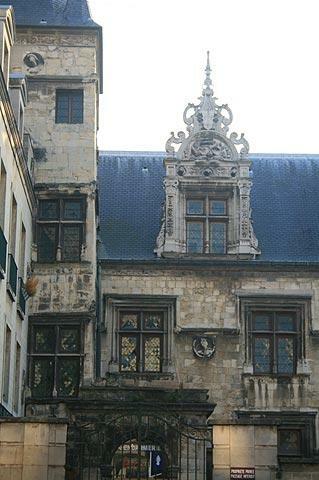 You can find more local travel ideas in the Calvados guide and the Normandy guide.